Framed Editions presents a collection of custom framed art, featuring the artwork of several of the world's most renowned painters and photographers. 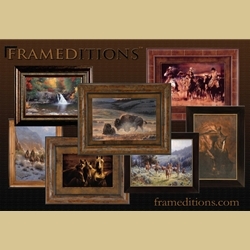 this collection encompasses primarily; Western, Native American, Wildlife, Lodge and Landscape subjects; available in a variety of collecctable and deocrative mediyums. Each piece is designed, custom framed and assembled in America to the highest quality standards, and available only through the most descerning retail outlets worldwide. For access to to this exciting new collection, talk to Kenton at Mountain Traditions. Call (970) 870-7976 or email kenton@mountaintraditions.com.